﻿ Best Price on Cattleya Apartments Curacao in Willemstad + Reviews! 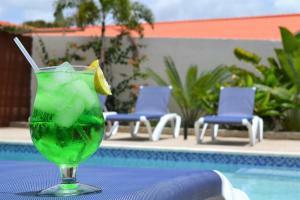 Cattleya Apartments Curacao is a self-catering accommodations located in Willemstad. Free WiFi access is available. The property is 6.2 mi from Queen Emma Bridge and 6.1 mi from Curacao Sea Aquarium. The apartment includes air conditioning, a patio and a terrace. There is a kitchenette with a microwave and a refrigerator. The private bathroom comes with a shower. You can enjoy garden views from the room. At Cattleya Apartments Curacao you will find a garden. Activities in the surrounding area include cycling. The property offers airport transfers upon request for a surcharge. If you feel like visiting the surroundings, check out Jan Thiel Beach (7 mi). Curacao International Airport is located 7 mi from the property. Please note payment must be made through PayPal. The property will contact you after you book to provide any transfer instructions. A security deposit of USD 200 is required upon arrival for incidentals. This deposit is fully refundable upon check-out and subject to a damage inspection of the accommodations. Please note that the price includes water and electricity for maximum of 10 KWH per day for the studio and the one bedroom apartment and 15 KWH for the two bedroom apartments.Guests who use more than this amount will be charged according to usage at the end of the stay. Please inform Cattleya Apartments Curacao of your expected arrival time in advance. You can use the Special Requests box when booking, or contact the property directly using the contact details in your confirmation. A security deposit of USD 200 is required upon arrival for incidental charges. This deposit is fully refundable upon check-out and subject to a damage inspection of the accommodation.